Cruciferous vegetables are vegetables of the family Brassicaceae (also called Cruciferae). These vegetables are widely cultivated, with many genera, species, and cultivars being raised for food production such as cauliflower, cabbage, garden cress, bok choy, broccoli, brussels sprouts and similar green leaf vegetables. The family takes its alternate name (Cruciferae, New Latin for "cross-bearing") from the shape of their flowers, whose four petals resemble a cross. Ten of the most common cruciferous vegetables eaten by people, known colloquially as cole crops, are in a single species (Brassica oleracea); they are not distinguished from one another taxonomically, only by horticultural category of cultivar groups. Numerous other genera and species in the family are also edible. Cruciferous vegetables are one of the dominant food crops worldwide. They are high in vitamin C and soluble fiber and contain multiple nutrients and phytochemicals. ﻿﻿﻿ The name Brassicaceae is derived from the included genus Brassica. Cruciferae, an older name, meaning "cross-bearing", describes the four petals of mustard flowers, which are reminiscent of a cross; it is one of eight plant family names without the suffix '-aceae' that are authorized alternative names (according to ICBN Art. 18.5 and 18.6 Vienna Code), thus both Cruciferae and Brassicaceae are used. The family consists mostly of herbaceous plants with annual, biennial or perennial lifespans. However, around the Mediterranean they include also a dozen woody shrubs 1m - 3m tall, e.g. in northern Africa (Zilla spinosa and Ptilotrichum spinosum), in the Dalmatian islands (Dendralyssum and Cramboxylon), and chiefly in Canarias with some woody cruciferous genera: Dendrosinapis, Descurainia, Parolinia, Stanleya, etc.. The leaves are alternate (rarely opposite), sometimes organized in basal rosettes; in rare shrubby crucifers of Mediterranean their leaves are mostly in terminal rosettes, and may be coriaceous and evergreen. They are very often pinnately incised and do not have stipules. The structure of the flowers is extremely uniform throughout the family. They have four free saccate sepals and four clawed free petals, staggered. They can be disymmetric or slightly zygomorphic, with a typical cross-like arrangement (hence the name 'Cruciferae'). They have six stamens, four of which are longer (as long as the petals, so relatively short in fact) and are arranged in a cross like the petals and the other two are shorter (tetradynamous flower). The pistil is made up of two fused carpels and the style is very short, with two lobes. Superior ovary. The flowers form ebracteate racemose inflorescences, often apically corymb-like. Pollination occurs by entomogamy, nectar is produced at the base of the stamens and stored on the sepals. The fruit is a peculiar kind of capsule named siliqua (plural siliquae, American English silique/siliques). It opens by two valves, which are the modified carpels, leaving the seeds attached to a framework made up of the placenta and tissue from the junction between the valves (replum). There is often an indehiscent beak at the top of the style and one or more seeds may be borne there. Where a siliqua is less than three times as long as it is broad, it is usually termed a silicula. The siliqua may break apart at constrictions occurring between the segments of the seeds, thus forming a sort of loment (e.g., Raphanus), it may eject the seeds explosively (e.g., Cardamine) or may be evolved in a sort of samara (e.g., Isatis). The fruit is often the most important diagnostic character for plants in this family. Brassicaceae do not form mycorrhizae, although rare exceptions do exist. Most members share a suite of glucosinolate compounds that have a typical pungent odour usually associated with cole crops. Matthiola (stock), Cheiranthus, Lobularia and Iberis (candytufts) are appreciated for their flowers. Lunaria (honesty) is cultivated for the decorative value of the translucent replum of the round silicula that remains on the dried stems after dehiscence. Capsella bursa-pastoris, Lepidium, and many Cardamine are common weeds. Isatis tinctoria (woad) was used in the past to produce the colour indigo. Arabidopsis thaliana is a very important model organism in the study of the flowering plants (Angiospermae). 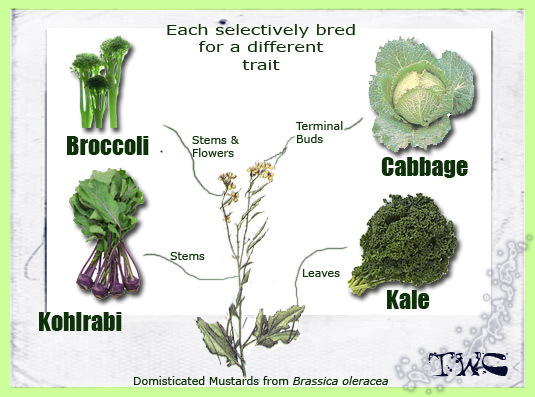 The family is included in Brassicales according to the APG system. This family comprises about 365 genera and 3200 species all over the world. The plants are mostly herbs. A close relationship has long been acknowledged between Brassicaceae and the caper family, Capparaceae, in part because members of both groups produce glucosinolate (mustard oil) compounds. Recent research (Hall et al. 2002) suggests that Capparaceae as traditionally circumscribed are paraphyletic with respect to Brassicaceae, with Cleome and several related genera being more closely related to Brassicaceae than to other Capparaceae. The APG II system, therefore, has merged the two families under the name 'Brassicaceae'. Other classifications have continued to recognize Capparaceae but with a more restricted circumscription, either including Cleome and its relatives in Brassicaceae or recognizing them in the segregate family Cleomaceae. The APG III system has recently adopted this last solution, but this may change as a consensus arises on this point. This article deals with Brassicaceae sensu stricto, i.e. treating Cleomaceae and Capparaceae as segregate families. Brassicaceae is a large and complex family of considerable economic importance to humans. It is most highly diversified in central and western Asia, Mediterranean Europe and western North America. See Video about: Raw Cruciferous Vegetables and Thyroid Health-My Personal Case History.